This free, printable business plan can help bail bond agencies identify weaknesses and strengths within their corporations and create projected profit and loss charts. [COMPANY] was established in 1990 and is located in [CITY], [STATE] but is licensed to serve its clients throughout the entire State. The Company is a Bail Bond Agency which will act as a surety and pledge money or property as bail for the appearance of a criminal defendant in court. [COMPANY] is seeking $1,500,000 in grant funding for the expansion of this Business. Goad Bail Bail Bonds acts as a surety and pledges money or property as bail for the appearance of a criminal defendant in court. The Company has a standing security agreement with local court officials, in which they agree to post an irrevocable "blanket" bond, which will pay the court if any defendant for whom the Company is responsible does not appear. [COMPANY] charges a fee of 10% of the total amount of the bail required in order to post a bond for the amount. This fee is not refund able and represents the Company's compensation for its services. If the defendant fails to appear in court, [COMPANY] is allowed by law and/or contractual arrangement to bring the defendant to the jurisdiction of the court in order to recover the money paid out under the bond, through the use of a bounty hunter. [COMPANY]' competitive edge is the customer service experience and reputation with referring attorneys. The pricing, unassuming and good natured approach to all clients is evident and highly appreciated. The Company also involves itself with the Sheriff's Association in which donations are made to fund raisers and auctions. Based on the detailed financial projections, [COMPANY]' future sales for 2010, 2011 and 2012 are expected to be $440,000, $750,000 and $960,000, respectively. 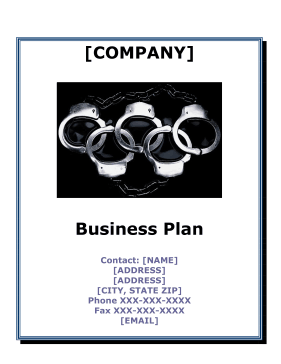 The mission of [COMPANY] is to be the premiere Bail Bonds Company within the State of [STATE]. [COMPANY] hopes to serve its clientele who demand honest, knowledgeable, and reliable service. By supporting and training Bail Bond Agents, [COMPANY] will stimulate its local community by creating employment with opportunities for growth advancement.